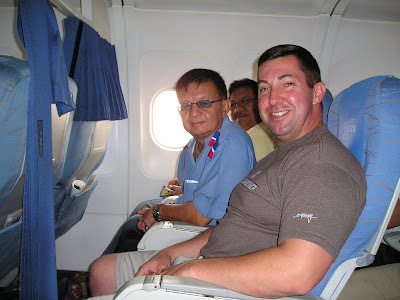 When we flew going to Manila after my late brother-in-law's internment, a man talked to me in the plane. We had a little talk about why I went in Bicol and this and that. When I mentioned to him what province my wife is from, his face immediately brightened up. He told me that he is the governor in that province. My wife took a photo of us before we took off the plane. Nice talking to you governor! Great, John. You had nice time during your travel. i wonder if you eat their delicacies. oh that's great..i wonder if you know now how to speak Bicolano because my husband can now talk a little bisaya and tagalog...hhehe he's from NC. Great! Good photos. Who is this governor and the province? You can ask him some favours, will you? wow u look like the ambassador, too hehehe. talo mo si governor sa looks, hehehe.have this interpreted by rose, lol. Awesome!who would have thought you will met the governor in bicol at the plane. Did he invited you for a dinner at his place john?hehehe just kidding. Well, you better start learning to speak bicolano, who know when you plan to live in bicol when you retire they might want you to run as mayor or governor there. aw! thats good to know! what's his name?? is he VILLAFUERTE?? Wow Lucky you..btw what the name of that governor? ?hahahaha..no idea who he is..
whoa! ahahaha! he looks so cute. My nephew had the same pic also, bathing at huge laundry basin! take care man! woww.. that's great, john. meeting people like him is something.